I enjoy sweet, funny picture books, but every so often I love wickedly funny books that make me laugh and cringe at the same time. 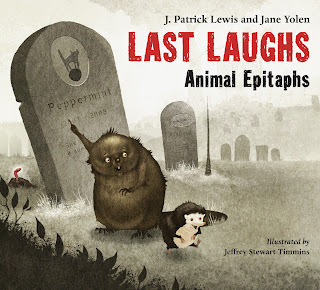 If you're looking for something a little different for kids ages 8 to 12, check out Last Laughs: Animal Epitaphs. Kids who like puns and dark humor will have fun with these gruesome poems, marking the unfortunate ends of all types of animals. Jeffrey Stewart Timmins' illustrations add to the dark humor, with visual puns, a smoky pallet and plenty of blood and guts. My students loved seeing how animals from these early poems show up as ghosts or apparitions in later pictures. I laughed and snorted my way though this. The macabre humor will be just perfect for some, but it will definitely turn others off. Third grade boys loved it. My 13 year old daughter thought I was nuts. But then, that's nothing new. But best of all, I like the way these poems make students stop and think. For kids who like this sort of dark humor, they'll come back to this collection again and again, dipping in and enjoying a bit more each time. This isn't a collection that you'll read in one sitting from cover to cover, but it's perfect for sampling its wicked humor and choosing your favorite poem. 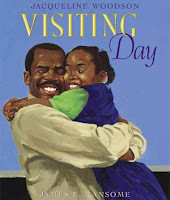 J. Patrick Lewis is the U.S. Children’s Poet Laureate and the Winner of the National Council of Teachers of English (NCTE) 2011 Excellence in Children's Poetry Award. Yolen is one of my favorite authors, from her novels to picture books. They both have a keen ear for language and a vital sense of what makes kids laugh. The review copy came from our school library collection. All images shared above are copyright ©2012 by Jeffrey Stewart Timmins, shared with permission from the publisher. The poems are copyright ©2012 by J. Patrick Lewis and Jane Yolen. If you make a purchase using the Amazon links on this site, a small portion goes to Great Kid Books (at no cost to you!). Thank you for your support. Do you have any little monsters in your house? They could be kids who love pretending to stomp and gnash and growl. Or they could be little terrors who fight and kick and scream. 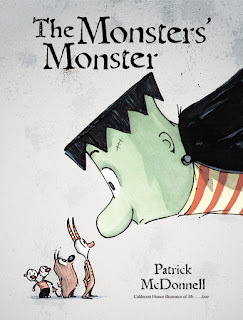 I love Patrick McDonnell's new book, The Monsters' Monster, for the way it takes both of these types of monsters, and then throws in a twist! This fun picture book will make kids laugh, think and want to read it again and again - what a perfect combination. Once upon a time, there were three little monsters who thought they were the toughest, grouchiest, loudest monsters around. In fact, they spent all their time trying to out-monster each other. One day, these trouble makers decide to build a MONSTER monster of their own: “the biggest, baddest monster EVER!” But they are in for a surprise. It turns out he isn’t exactly the monster that the little guys were expecting. Instead, their big, giant monster is happy. He giggles. He hugs them (with a crushing monster squeeze). And he isn’t grouchy at all. In fact, he’s thankful. The little monsters who created him are indeed perplexed by this, even stunned into speechless quiet. Patrick McDonnell’s artwork combines the humor of cartoon figures with watercolor and ink backgrounds, skillfully creating the tone of the story. The ending will bring smiles and contented sighs to adults and children alike, as the monsters realize they all are thankful for their new friend. 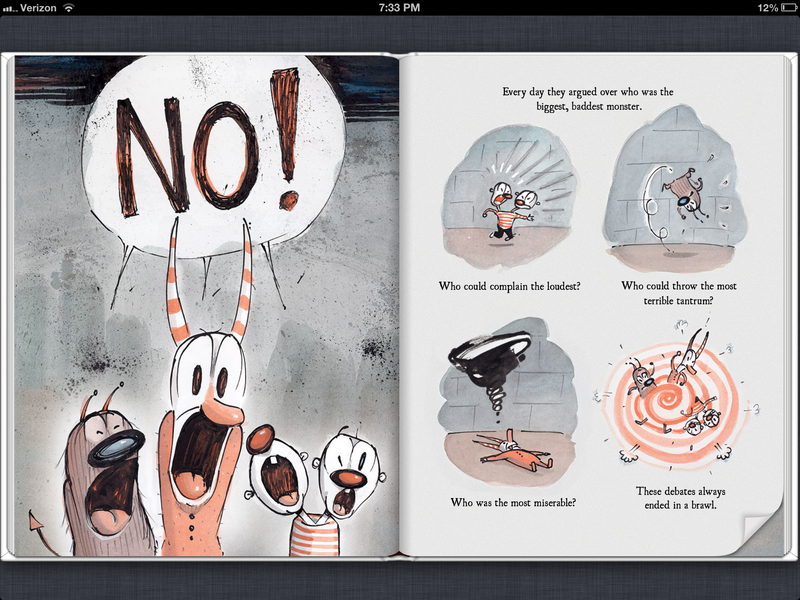 Little, Brown has also released this as an enhanced ebook on the iTunes Book store and Nook Kids Read and Play store. 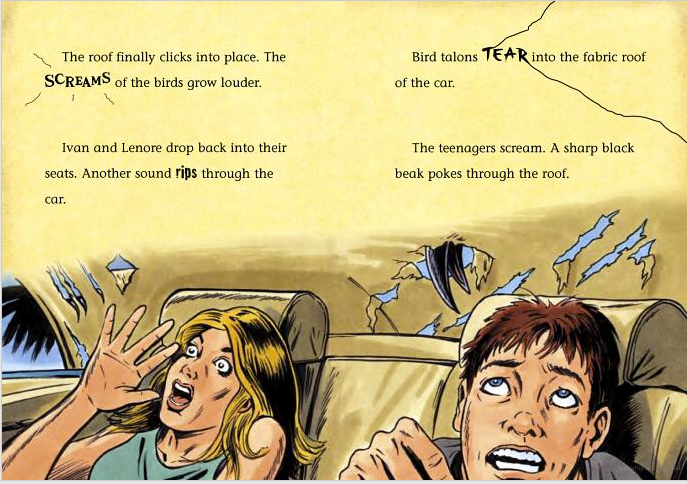 These enhanced ebooks combine audio narration with the picture book, along with some basic, limited interactions. Kids in my library have loved listening to the pitch-perfect narrator for The Monsters' Monster. They were a little unsure when to tap images and when to just read and listen. But the more limited interactivity kept the focus squarely on enjoying the story. It's definitely one they gave two thumbs up (and plenty of laughs - even from 8 year old boys). Tasha at Waking Brain Cells says, "McDonnell’s writing is perfect for reading aloud, setting the right pace and tone to make it a wild rumpus of a read." Over on Goodreads, my friend Alyson Beecher writes, "We could all use some reminders of the need for simple gratitude. Done with humor but really sweet." Pamela Paul writes in the New York Times, "Alas, as Victor Frankenstein found out long ago, monsters rarely conform to their creators’ intentions. In this case, there’s nothing scary about him. He’s actually quite endearing." Jenny Brown's interview with Patrick McDonnell over at the Kirkus Reviews blog. McDonnell tells us that as he started to work on this story and think about the three little monsters, "I began to think: 'What makes a monster a monster?' The answer I came up with was—his thoughts." All images shared above are copyright ©Patrick McDonnell, 2012 shared with permission from the publisher. The review copy was kindly sent by the publisher, Little, Brown Books for Young Readers. If you make a purchase using the Amazon links on this site, a small portion goes to Great Kid Books (at no cost to you!). Thank you for your support. Are you talking about the presidential election with your children? How do you share about these grownup debates with kids? I try to convey the importance of the country's decision, how we all have a part to play. It's also important to introduce some of the basic terms of the election process with kids. After all, they hear grown ups talking about it all the time. What would it be like to run for president? 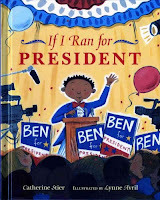 I enjoyed sharing this book with students, helping them imagine what it would be like to be a candidate. The pictures show all sorts of kids asking questions like, "Am I the best person for the job? Am I ready to work VERY, VERY, VERY hard for my country? Do lots of people believe in me, and will they help me run for office?” My students appreciated Avril's multicultural cast of kids. Stier writes in a fun, personal way while integrating some key election terms ranging from primaries and caucuses to the Electoral College and presidential debates. One morning, Mrs. Barrington shows her class pictures of the presidents. Grace, a lively African American girl, asks her teacher, "Where are the girls?" 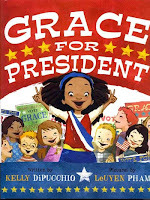 Grace is stunned when she finds out that no girls have ever been elected president. Not one to take things sitting down, Grace declares, "I've been thinking it over, and I'd like to be president!" Mrs. Barrington seizes on this idea and hold a school election, with each student voting in the Electoral College for a different state. Pham's illustrations are full of joy, energy and emotions. Kids love the division of kids along gender lines. While Grace is African American, race is never an issue. This is a fun story kids love to read again and again. 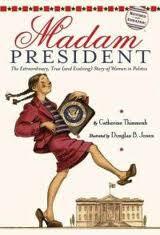 With a great combination of facts, humor and pizazz, Catherine Thimmesh shares short two-page profiles on dozens of women who have made their mark, "a lasting footprint-whether it be pointy-toed and spike-heeled or rubber-soled and loosely laced-on the very bedrock of America" and the world. Starting with first ladies who found ways to influence and shape political policies and the nation's discourse, Thimmesh shows young readers how these women affected the world around them. She balances the information and humor perfectly, providing background context, interesting details, and primary source quotations without ever sounding like a textbook. Originally published in 2004, this revised 2008 edition has updated information on Hillary Clinton, Nancy Pelosi, and Condoleezza Rice. If you're looking for fun, you've got to turn to our favorite comic book hero: Babymouse! Kids at our school library love, love, love Babymouse. So this is a natural to share at this time of year. Babymouse decides she's going to run for student council president, going up against her arch-nemesis Felicia Furrypaws and even her own locker! Life is never smooth sailing for Babymouse (Typical! ), and this election is no different. When Felicia promises that kids will have an ice cream sundae at school every day, Babymouse wonders how much she can promise. Holm introduces a few elements of campaigning, but keeps the emphasis on school humor and elections. 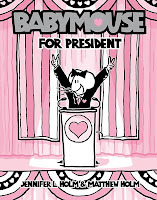 If you've got Babymouse friends in your house, head over to the great Babymouse Website to check out the election coverage! There are campaign videos and online voting - very fun! I haven't gotten a chance to see Michael Townsend's Where Do Presidents Come From? My students have had great fun reading his wacky take on the Greek myths in comic book form in Amazing Greek Myths of Wonder and Blunder. The publisher's description of this new book says, "It's full of insanely weird facts about our leaders (Did you know that President Coolidge had a pet pygmy hippo named Billy? ), as well as the history and powers of the presidency, day-to-day life, and pros and cons of the job." Sounds like more wacky fun that my 4th and 5th graders will eat up! The review copies for all of these came from our school library. If you make a purchase using the Amazon links on this site, a small portion goes to Great Kid Books (at no cost to you!). Thank you for your support. Kids are full-swing in the Halloween mood. The weather is cooling off, fall is here and kids talk nonstop about their costumes. I love building on this excitement by sharing scary books. But little kids need books that are scary without being too frightening. 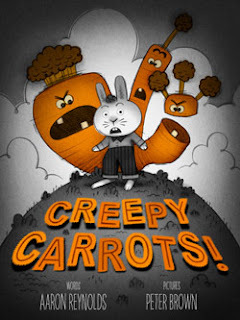 For some Halloween fun, try out Creepy Carrots. Kids will laugh at the jokes, love the shivers, but know that it's all just pretend the whole time. Jasper Rabbit loves carrots. He eats them going to school, going to baseball practice and then on the way home again. Jasper pulls carrots up from the ground anywhere he can find them — especially in Crackenhopper Field. But soon, Jasper starts seeing maniacal, monster carrots stalking him at every turn. “Monster carrots?” you say. 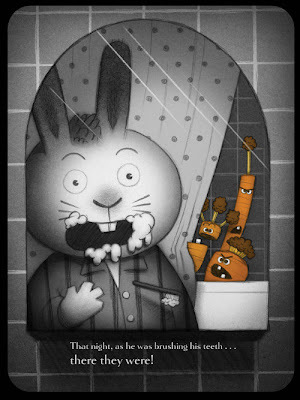 Yes, indeed — creepy, monster carrots. Reynolds and Brown work together brilliantly, building suspense, eliciting laughter, creating a Twilight Zone–feel for this creepy tale of vegetable revenge. Is Jasper being stalked by snarling, angry carrots or is it his overactive imagination? Young kids will delight in the spooky elements of this story, laughing at Jasper’s fear while completely understanding just how it happens. After all, kids know all about having to check the closet for monsters that might just be waiting to pounce. The ending brings the story right back to its humorous side, providing a satisfying lesson on greed through laughter instead of preaching. This is a great new book perfect for kids who like to shiver and laugh at the same time. I loved this book trailer! It's also fascinating the way Peter Brown talks about his inspiration for the illustrations. It would be very interesting to show this to older students, and ask them about the illustrator's perspective. 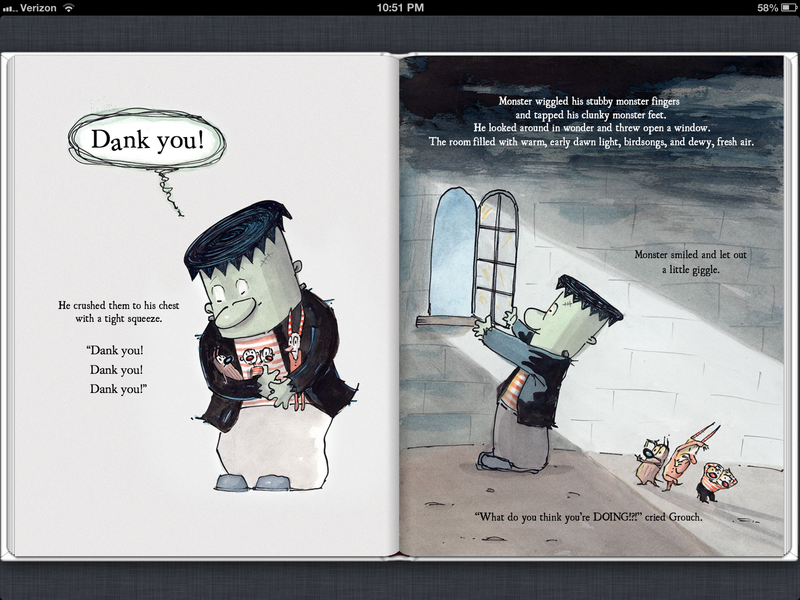 For other great Halloween reads, check out my monthly Bookshelf article at Parents Press: Monster Madness. 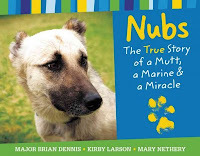 I enjoyed reading other reviews on Five Minutes for Books and Fuse #8, as well as Julie Danielson's post on the Kirkus Blog. 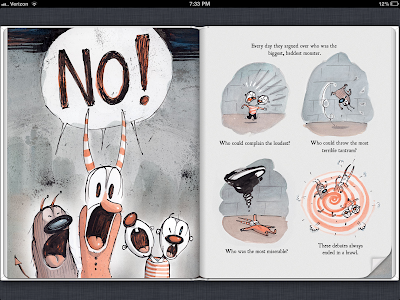 Last year, the Cybils Awards launched the first BOOK APP AWARD for children and young adults. The Cybils Awards are given each year by bloggers for the year's best children's and young adult titles. Anyone can nominate a book between October 1st and October 15th. That means you have one more week to nominate your favorite book app that was published last year. Head here to nominate a book for the Cybils Award! Findability is a huge problem when it comes to book apps. What are the most recent apps published? What will appeal to my children? I often turn to the Kirkus Reviews site to explore their in-depth reviews of book apps. Here are some book apps that they have recommended this year. I have not read all of these apps, but I have read enough of Kirkus Reviews' recommendations to know they are worth exploring. PinkMe's Electronic Thursday - Paula focuses specifically on some fascinating nonfiction book apps. My students are still fascinated by last year's finalist Bobo Explores Light, and so we will definitely be checking some of these out. Masala Readers Cybils Wishlist - Lalitha has some great apps to recommend, with a focus on picture book apps ranging from sweet ones like Leah and the Owl to the funny The House that Went on Strike. 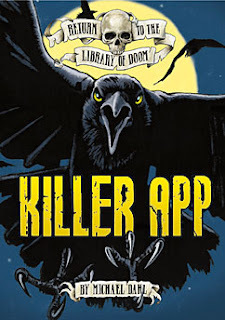 Here are some apps I'm investigating from Kirkus reviews. All quotes and links are from the Kirkus Reviews site. Franklin Frog, from the "Round" series, published by Nosy Crow. "This first installment in Nosy Crow’s new Rounds series of biology apps for preschoolers is actually a hybrid of sorts. The story offers plenty of frog facts... but there’s also fictional banter that gives the frogs a bit of character." The Voyage of Ulysses, developed by Elastico SRL. "This slimmed, prose version of Homer’s epic can be read aloud by a lilting narrator, or it can be read silently. All of the characters Ulysses meets on his long journey home are here...with a suitable amount of smoothly written text material to flesh out their backgrounds and roles." Dragon Brush, by Andy Hulling, developed by Small Planet Digital. "The story of a magical dragon brush that can bring painted objects to life casts its own spell. Bing-Wen, a slender rabbit from a poor family, loves to paint. His luck turns when he helps an old woman with an overturned cart and is awarded a paintbrush made from the whiskers of a dragon." B.B. Wolf, by Debbie Fong. "A revised 'Little Red Riding Hood,' with unusually simple and effective illustrations and interactive features. Fong suspends small figures drawn in thin, scribbly lines... creating narrative movement for her retelling with one or two discreet spiral buttons in each scene." Please take the time to nominate a book app for the Cybils Awards. All nominations from the public must be received by October 15th! I have been astounded by the connections I've made through social media, connecting to authors, teachers, librarians and others who are passionate about helping children find books that speak to them. This past weekend, I attended KidLitCon in New York City - it's an annual conference for bloggers who write about children's literature. It was a weekend of goodness, and one highlight was listening to Teri Lesesne (rhymes with "insane") talk about using Twitter to build a professional learning network. Teri pulled together so much of what I've experienced over the past year with Twitter. Teri Lesesne (@ProfessorNana on Twitter), often known as "the Goddess of YA", is a professor of children’s and YA literature at Sam Houston University. Teri was inspiring, informative and funny as she shared how social media, and Twitter in particular, has enriched her professional life. 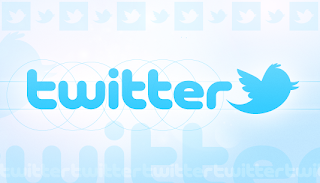 At its essence, Twitter is about connecting people who share common interests and enabling quick, meaningful conversations. Through her extensive network, Lesesne is able to reach out to teachers, school librarians, authors, publishers, editors and more to learn about children’s books. These are educated stakeholders who share information, experience and advice on an informal, collegial manner. Twitter continues to grow at astounding rates, attracting its largest demographic from women and from people ages 22-55 years old. Its usage has doubled within the last twelve months. With more limits on professional development funds, it is essential that we invest time and effort in developing our professional network in ways that don’t rely on attending conferences. Lesesne recommends finding a few trusted voices, following their conversations and exploring who they’re talking with. John Schumacher (@MrSchuReads), Donalyn Miller (@donalynbooks), Paul Hankins (@PaulWHankins) and Katherine Sokolowski (@katsok) all are excellent choices. Start by listening to their conversations and exploring links they share, but then try jumping in and adding your perspective. Finally, Lesesne recommended checking out a regular Twitter chat such as #titletalk. Titletalk is a monthly chat hosted by Donalyn Miller and Colby Sharp, held on the last Sunday of every month at 8pm Eastern time. Each month, teachers and librarians from across the US (and beyond) gather on Twitter to share their favorite children's books. Just last weekend, the Titletalk focused on book talking as a way to recommend books (archive available here). One great way to follow a Twitter chat such as this is using the website TweetChat. Check out more of Lesesne's excellent points through her SlideShare presentation. Follow her on Twitter (@ProfessorNana) - she shares a wealth of information. And stop by her blog (Professor Nana) to get great reading recommendations. 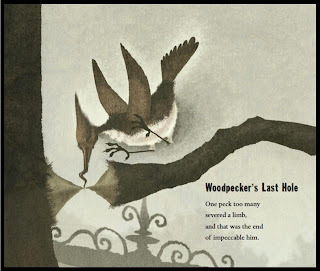 I really enjoy using Twitter to connect with librarians, teachers and children's book lovers. It's a wonderful resource for when I'm trying to think of new titles to share with kids. And the best is connecting with others who are just as excited about sharing books. Come say hi to me on Twitter if you get a chance - I'm @MaryAnnScheuer.